Huw Millington is not only the Mastermind behind the famous Lego Website brickset.com. He also is a MOCer, who has created a fantastic city layout with many surprises: Interview. 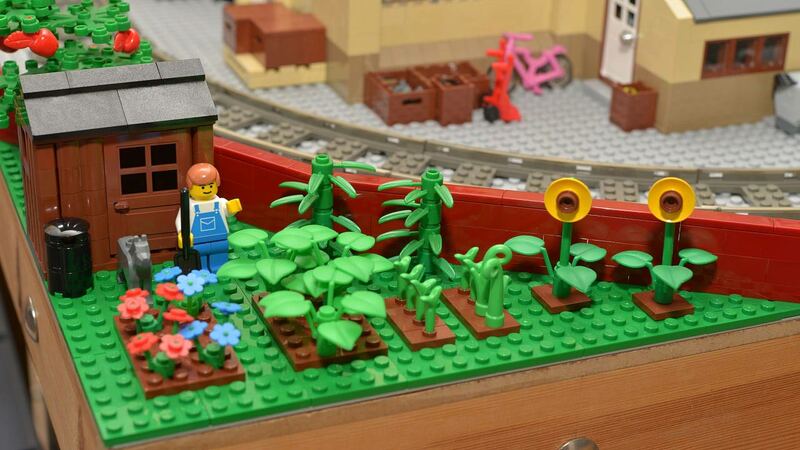 A town layout which includes many houses, a hill, a train station and many other fine urban details is the dream of every AFOL, who has grown up with Lego City and the 9V train system. 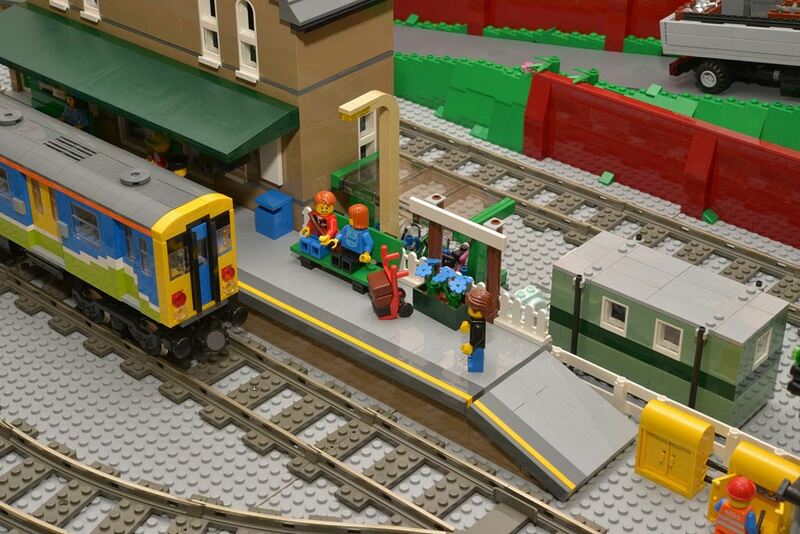 Huw Millington, founder of the very popular British website brickset.com, is a MOCer, who was created a very special city layout, which includes all those things. Thankfully, I was able to ask Huw everything I’d like to know about his very British city – also he send us some very nice images of his little town. So, here we go. 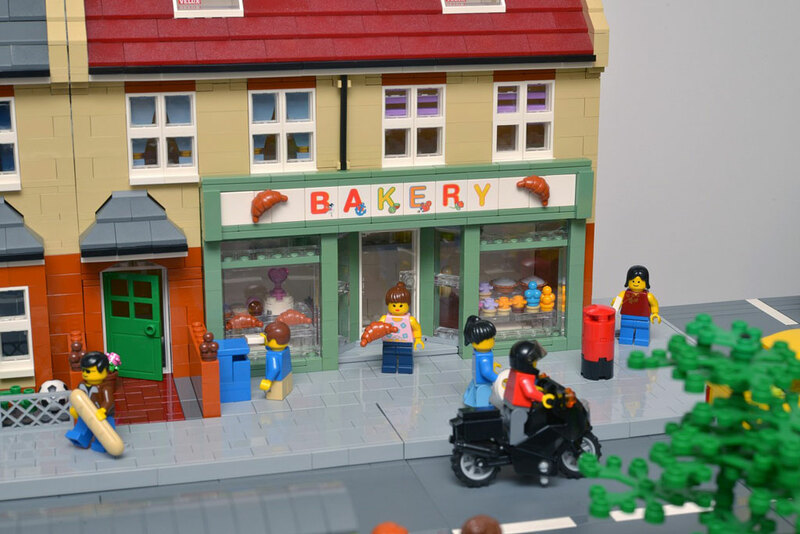 Hello Huw, your very fine and detailed Lego City layout has been one of the highlights at the Bricktastic event in North England a few weeks ago. 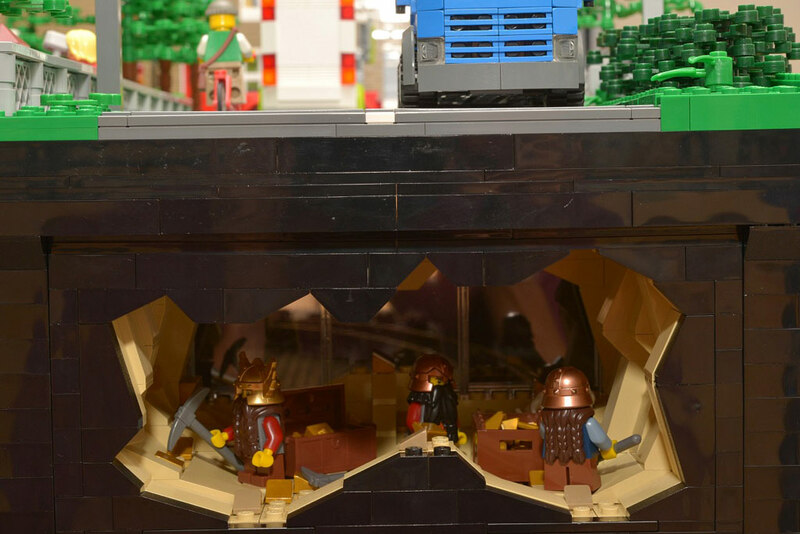 Was it the first time, that you have shown this MOC in front of an audience? And how was the reaction to your city? 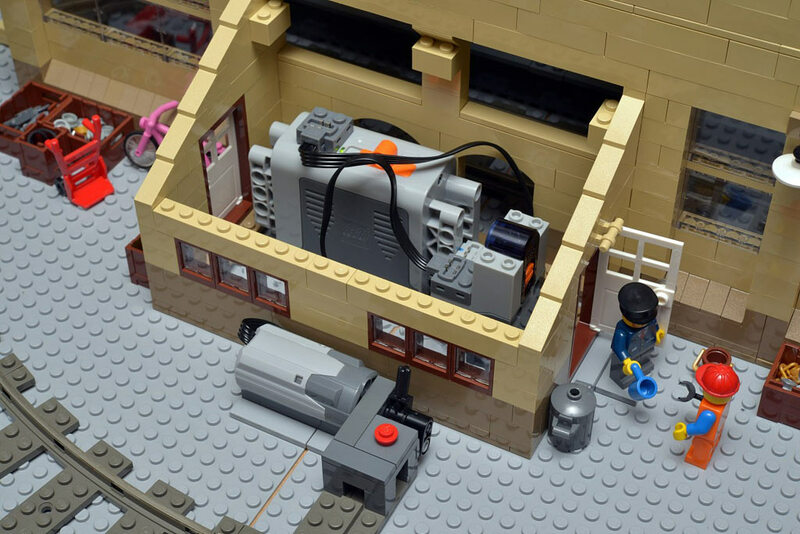 Huw Millington: Yes, Bricktastic was the first time it had been displayed although I built some of the buildings a while ago. 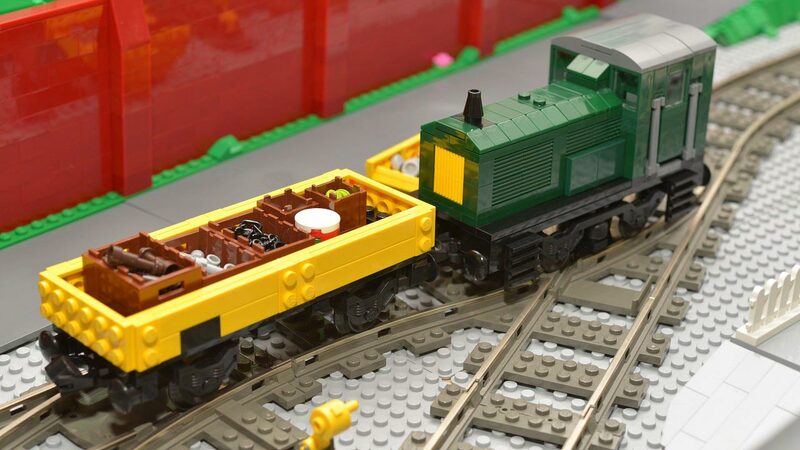 Until recently I collaborated with others on a larger train layout which we would assemble at the Great Western Brick Show in Swindon every year so a few of them were used in my section of the display. The reaction was great, both from the public and other exhibitors. The public liked spotting the familiar details and the kids loved watching the trains going round and round and seemed to be more fascinated with them when they were out of view in the tunnel than when they could see them. 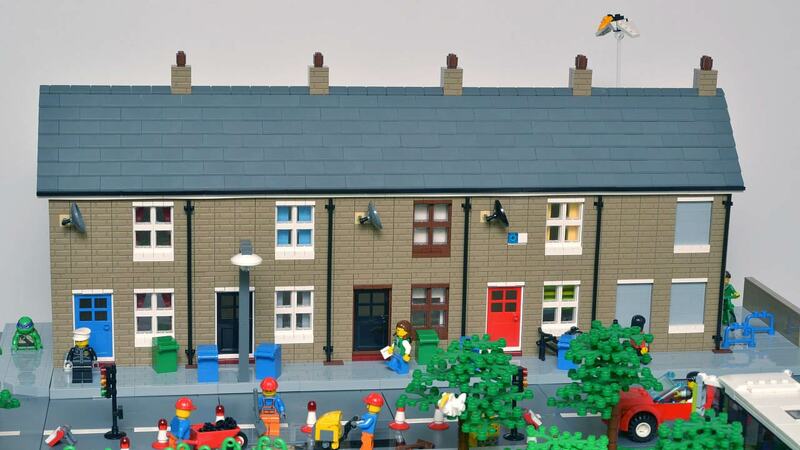 I had many conversations about the design of the houses which people thought looked like ones where they lived, which given the show was in Manchester is more than likely, and also the refuse collection and the colour of the wheelie bins which are different colours depending on where you live. How much time do you spend on this huge layout? I started it in May this year, in preparation for displaying at Bricktastic in August, so 4 months on-and-off although as I said above some of the terraced houses were built a while ago, as were most of the trains, although I took the opportunity to update them using elements that weren’t available when they were first constructed, such as the 2×2 curved slope piece (it and the 1×2 version are my new favourite pieces) are great for train roofs. There is a row of middle class houses on a hill, a railway with a nostalgic station – do you had any particular town in mind, when you start building your City? Not really! The houses on the left were based on a photo I found while Googling ‘terraced houses’. I’ve no idea where it was taken, somewhere in the north of England, I suspect, but they are generic enough that they could be anywhere in the country. I was attracted to them because they were an interesting design which would translate easily into LEGO form. Those on the left were constructed this year and are typical working class terrace houses built in the early 20th century which, again, can be found in any industrial city in England. The boarded up one is, unfortunately, also typical of many inner city areas. 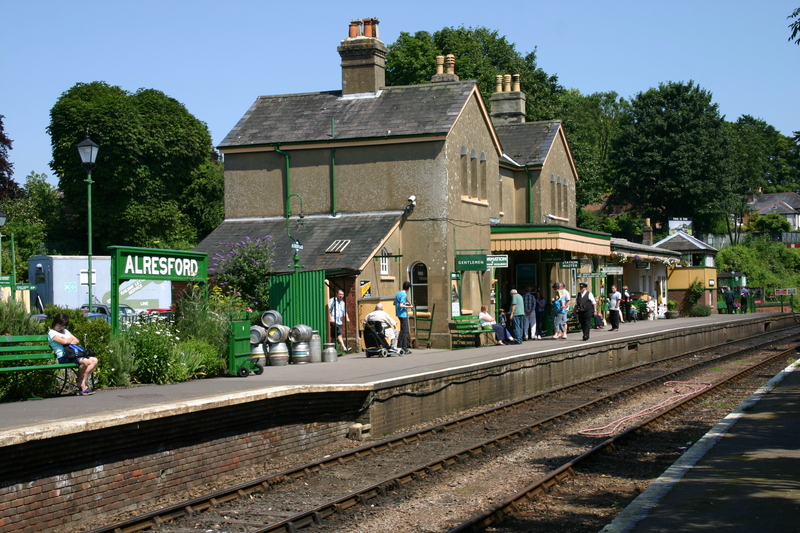 The station building is based very loosely on Alresford station on the Mid-Hants steam railway which is near where I live in the south of England. So, it’s all a bit of a mash-up! The front of the houses looks very realistic. Are there any details inside the buildings, too? Thank you. What fascinates me about rows of terraced houses is that when they were built they all looked the same. But then, over time, people make improvements, paint their front door, change their front garden, maybe replace the roof or add Velux windows and as a result they all look slightly different. I tried to replicate that in my model. They were built to be looked at from the front only. They have backs but only to stop being able to see straight through the windows to whatever’s behind the display. There are curtains or blinds behind the windows but that’s is in terms of inside details apart from in the bakery at the end of the terrace which has lots of delicious looking cakes and bread in the window! Do you have an idea, how many bricks you use for your creation? Absolutely no idea! 50,000 perhaps? I really don’t know, or know anyone who counts the bricks they use in their MOCs! In any case, do you order your bricks, exspecially the ones in the very nice and „rare“ colours – at bricklink.com? Or do you have your own secret factory in the basement? I’ve been amassing bricks for at least 15 years so have had to buy relatively few from BrickLink, just a few of the more recent parts, like the 2×2 slopes I mentioned. I probably have close to ½ a million bricks at my disposal which have come from various places: LEGOLAND Windsor pick-a-brick when they had a decent selection at a decent price (at least 10 years ago!) and more recently, Lugbulk. 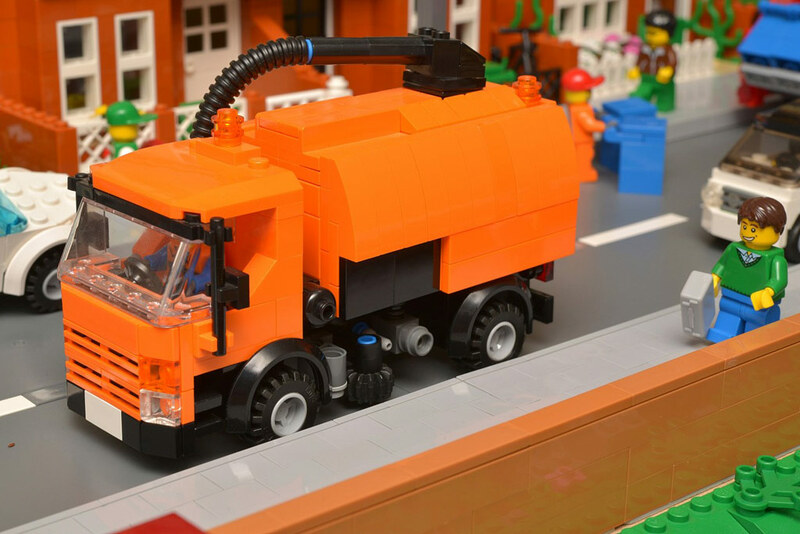 Do you use bricks to increase the „upper city“ – or Duplo? Like so many other AFOLs, you still use the 9V technic for your city. Is there a pattern for your trains? The 9v system is still the most practical for using at exhibitions, particularly if you have tunnels: infra-red controlled trains can’t be stopped in them! Thankfully I have enough track and motors to last a lifetime and they just run and run without any problem year after year. However, this year I’m using Power Functions medium motors for the point motors for the first time because the motors I used before, ‘monkey motors’ (the square transparent ones), have all broken internally or seized up. They work well and for the layout’s next outing at Swindon I’ll be remotely controlling them with PF IR controllers. 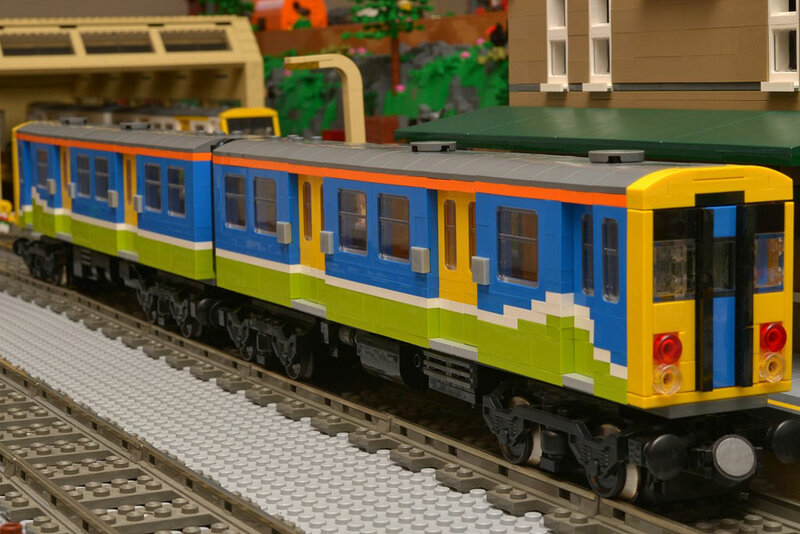 The trains themselves are loosely based on UK designs. I don’t ‘rivet count’ or attempt to make scale replicas, I just try and capture the essence of them, to make them recognisable, but without making them overly complicated or fragile. When I was young I used to travel the country photographing railway wagons so I have a large amount of material to draw upon when building freight stock, but even so I don’t worry too much if they don’t look exactly like the real thing: it’s LEGO after all, so some compromises have to be made. I guess I am inspired and influenced by particular designs or colour schemes but I don’t set out to replicate things exactly. Which one of the cars is your favourite one? 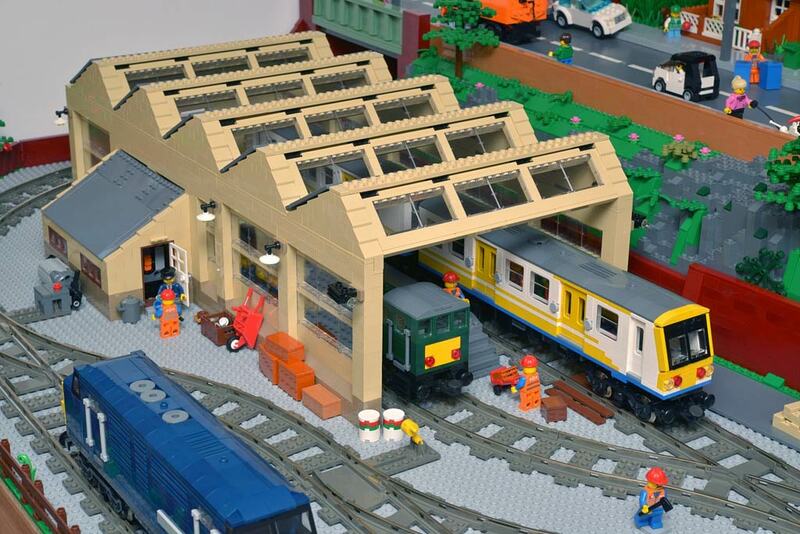 And what do you like most about your layout? Probably the dark blue diesel at the moment. It’s very loosely based on a class 37 and was originally built in blue with lots of cheese slopes on the roof and nose. Now that there’s enough parts available in dark blue, including my favourite 2×2 curved slope, I rebuilt it this year in that colour, which is closer to ‘BR blue’ as used on British Rail locos l in the 1970s and 1980s. That model is a good example of compromising to keep it simple: a class 37 is a Co-Co (3 wheels per bogie) and has a three-pane window, but making motorised 3-wheel bogies is nigh-on impossible without a lot of messing about, and LEGO only makes a 2-pane train window, so rather than try and implement something complicated in SNOT (‚Studs Not On Top‘), I’d rather keep it simple. Nevertheless it’s still recognisable as what it’s supposed to represent and the vast majority of exhibition visitors aren’t going to notice or care that it’s not 100% accurate. Do you use any programs, to „create“ your city in a digital way, first? Or how do you plan this layout? No, I’m not one for using LDD or LDraw: I just get on and build. I guess having sufficient brick stock means I don’t need to work out what parts are needed in advance and then order them: I just reach for the parts from my drawers. So, do you still change some parts of this build at home, or is it finished? Can you imagine, to expand this layout some day? And do you have a name for your little town? I have it set up at home at the moment and I can’t help but add little details here and there! I don’t suppose it’ll ever be finished! 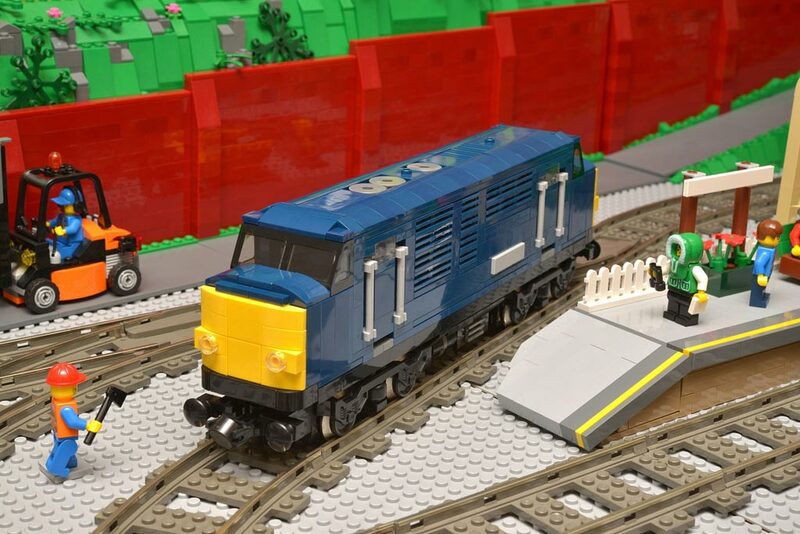 I’m going to leave it at the size it is this year, when I’ll be taking it to GWBS (‚Great Western Brick Show‘), and the two Brick shows in Manchester and London, then look to expand it by five or ten track lengths next spring, in preparation for exhibitions later in 2016. I’d like a bit more length in the railway yard area to allow for longer trains and to provide better scope for shunting. 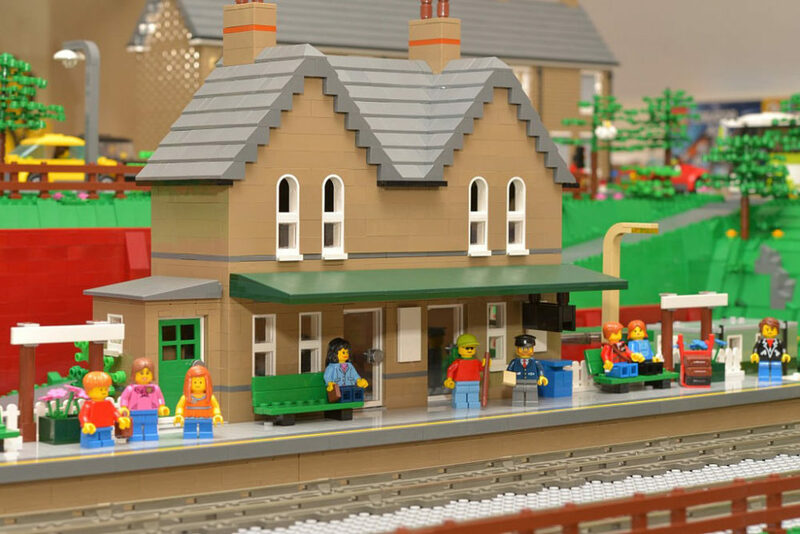 As for a name, I can’t think of anything very original, so I’ll probably get some 1×8 plates for the station name boards printed with ‘Brickton’. 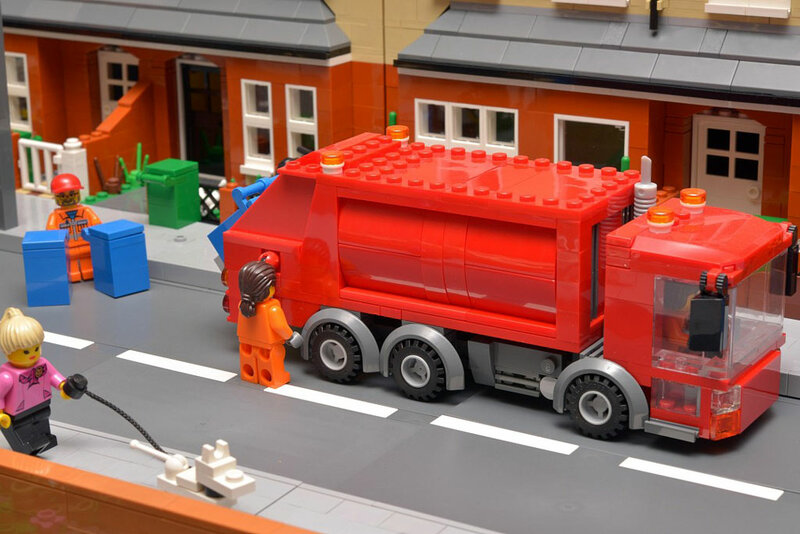 Do you have any new Lego building project in mind, yet? May be a twin town? No, I suspect this till take up all my spare time and energy for the foreseeable future. Thank you so much for your time and brick on. Please follow Zusammengebaut on Twitter, Facebook, YouTube and Instagram.